If you sift through Boston Globe articles written about the Rindge Towers in the past half-century, you will mainly find stories about tenants fighting to keep their homes. Politicians are often the champions in these stories, speaking about the value of affordable housing and their many years of involvement in the fight to protect low-income homes. The people that knocked on doors, printed fliers, and built organizations of tenants are left out of the picture. More often than not, they simply aren’t given the credit they deserve. Rindge Towers in Cambridge, Massachusetts. Photos by Ashwin Balakrishnan. Pat Casola is one of these people. She changed the fate of the Rindge Towers when she decided to form the Rindge Towers Tenant Association and to build a network of local and national organizers to protect affordable housing. We (Ashwin and Rachel, MIT students in a class called “In This Building“) were drawn to the history of the Rindge Towers because they are the most visually striking affordable housing development in Cambridge. Three 22-story towers disrupt an otherwise flat skyline on the western edge of the city. We knew we didn’t have time to tell the stories of the towers’ hundreds of residents, so we hoped to find just one person that embodied the history and spirit of the place. We were lucky to find Pat Casola. Our path to Pat was serendipitous, the result of a fishing line of inquiries cast into the Internet pond. We couldn’t find an address, phone number, or email for Pat, so in desperation we did a Google search for her name. One of the first search results was a Facebook photo album that showed her receiving an ‘Unsung Heroines’ award from the Massachusetts Commission on the Status of Women. The album was featured on Massachusetts State Senator William Brownsberger’s Facebook page, so we decided to send him a message to see if he had Pat’s information. Surprisingly, Brownsberger got back to us within minutes saying that he didn’t have Pat’s contact information on file anymore since she is no longer a constituent due to recent redistricting. However, he suggested that we could find her by visiting 362 Rindge and asking around for her. 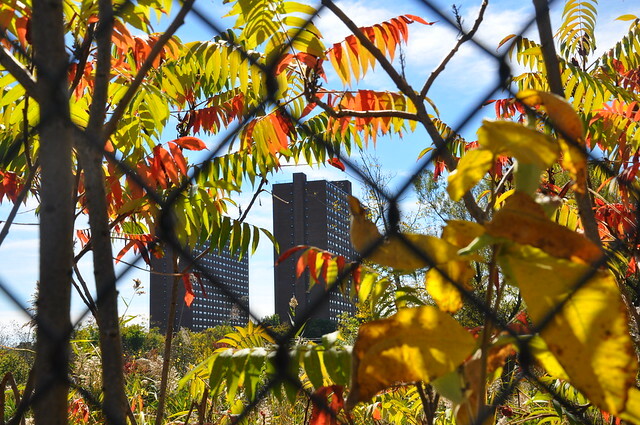 On a late September afternoon, we biked from MIT to the Rindge towers, tracing the east-west transect of the city. As we turned away from the congestion and student-propelled energy of Mass Ave. onto Rindge Ave., the towers come into stark profile almost immediately: 3 red brick monoliths peeking out from the roofs of multicolored classic-Cambridge triple deckers, hulking over an old New England cemetery and nearly swallowing a small grocery store. 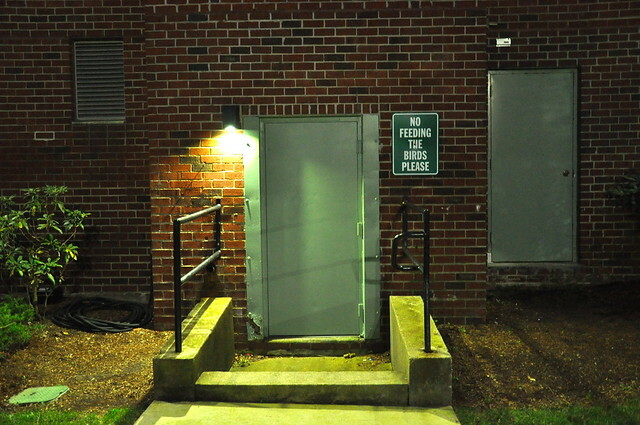 With only a few news articles and a facebook photo album to go by, we had little to base our assumptions on what life in Rindge Towers was like, nor what it meant to be a tenant organizer there. Being urban planning students, we wondered whether we would find an example of failed Towers-in-the-Park-style architecture, with little street life and alienated residents. 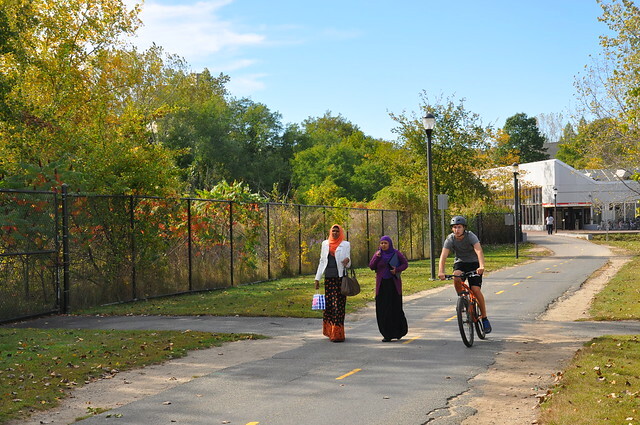 Rolling into the Rindge parking lot on our bikes, we saw residents of all ages – strolling, playing, sitting, and talking. A playground was full of children, with parents looking on from picnic tables and benches. Men held court in a circle of benches in the center of a path connecting the two towers, greeting the many passersby walking between the two buildings. Children spoke English to one another, but greeted adults in a half-dozen or more languages. Entering 362 Rindge, the security guard was at first wary of our request for Pat’s contact information. He seemed to warm up when we explained we were students working on a class project, brandishing our MIT ID cards for proof. The guard dialed Pat’s number on the building’s intercom, and the woman whose doorbell we had just rung answered without the least hint of surprise in her voice. After calling us “sweetie,” we figured it was okay to keep dialing her number to get more of the 60-second increments of talk time the intercom system allowed. We made an appointment to meet her the following week for an interview without yet having met her face-to-face. On a Tuesday morning, we took the Red Line to the last stop and then walked from Alewife Station towards the towers. Through this journey, it became obvious to us that the Alewife stop didn’t exist when the Rindge towers were built in 1971. The pedestrian connections between the towers and the station seem fragmented and caught in limbo between car-oriented and transit-oriented development. 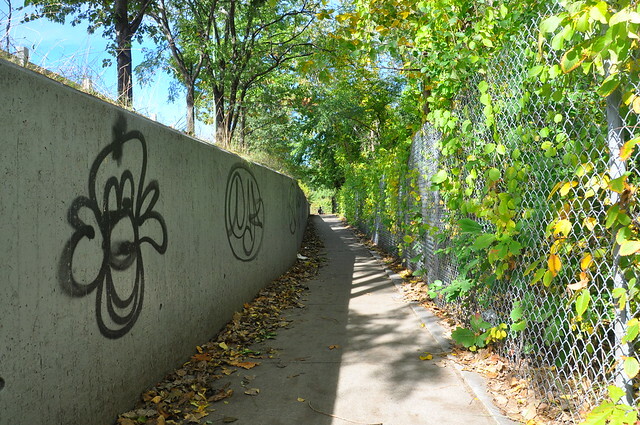 The path from the Alewife stop to the towers circuitously weaves through patches of urban wild land, runs parallel to a highway, and then crosses over Rindge Avenue before dropping you off at the gigantic brick towers. On our walk towards Rindge, we photographed the towers as they peeked over treetops and the many different types of people that ambled past us. We saw a South Asian man in a tall turban walking a broad-shouldered pit bull. When we asked him about his bulky dog, he replied in a Caribbean accent. The towers were already testing our assumptions. After arriving at the towers and locking our bikes to a stairway railing, we buzzed Pat on her intercom. As we walked through the narrow hallways to get to her apartment, the smells of home cooking from around the world mixed. Combined, it smelled like peppery patchouli. Pat’s door had its own makeshift doorbell and a handwritten sign that said “Beware of Dog”. Her unwelcoming door gave us pause. What kind of tenant organizer was she? Would she be an ideological organizer of the revolution? Would she be a puppet of the management company, bringing tenants together for token meetings? Pat’s apartment was full of boxes and pets. It was clear that she had lived there for a long time. She had an eclectic mix of posters and paintings on the walls: a neon abstraction of two lovers hugging on the beach, a heroine from a Japanese cartoon, a calendar with horses. These nonthreatening images seemed to belie the way that Pat was portrayed in newspaper articles as a tough organizer. Pat was extremely warm and accommodating, despite having health problems that keep her homebound. She prepared space for us to sit next to her bed and proceeded to tell us her story as her bird chirped in the background and her cat crept furtively around the room. Pat’s story was captivating. As we found out later, the room itself was one of the few in the entire building that had not been renovated – Pat deliberately put herself last in line, so as not to appear as though she was getting favorable treatment. This detail exemplified the rest of her story, and also answered our question on whether or not she was dedicated to her cause. She did not fit into any box – most importantly, she didn’t fall into the overly ideological stereotype that we might have imagined. She was balanced and thoughtful even about the most controversial and painful parts of her experiences. She began by rattling off an amazing number of facts and figures about the fight to preserve affordable housing in the Boston area over the last 30 years. The names of every politician, every intimidating building manager, every threatened family, as well as the corresponding years and numbers of apartments impacted by those names, were all still fresh in her memory. She began her work as an advocate after she witnessed the loss of affordable units in nearby Huron Towers. She wanted to prevent a similar coup at Rindge. Not knowing what it meant to be a tenant organizer, she told us that she just “jumped into it.” Connecting with local tenant advocacy groups, she formed the first tenant association at Rindge, emphasizing her efforts to engage as many residents as possible, including providing Spanish, Mandarin, Urdu, and other language translators at every meeting. Her efforts took her from Rindge Towers’ common room all the way to Washington, D.C., where she lobbied the Department of Housing and Urban Development for tenants’ rights. Although this story was clearly important to her, we noticed that the passion in her voice increased when she made the jump from stories of organizing people to stories of mobilizing people. More impressive than her memory was her consistent dedication. Year after year, struggle after struggle, she never seemed to doubt the power of mobilizing people to overcome obstacles, though today she is disappointed when current Rindge tenants who did not witness that fight don’t see the value in it. We asked her what kept her going – what force continues to drive and sustain someone like Pat? Without missing a beat, she replied, “the tenants. They’re like my children, my family.” The roots of her advocacy, we learned, went much deeper than the loss of Huron Towers. Every stage of her life story is marked by selflessness and caring for people. Pat grew up in East Boston. She began caring for her younger siblings at age 6. After graduating from high school, she married an Argentinean man with whom she ran a garage in Buenos Aires. Traveling outside of the United States for the first time, she developed a new awareness of herself as an American, and an American woman in particular. She described needing to defend herself against stereotypes, and learning how to articulate arguments to counter them. As the political situation in Argentina became untenable, she worked for a year to get herself and her husband out of the country. Upon her return, her newfound political consciousness led her out of that marriage and into the National Guard, where she trained as a nurse. She describes finding her calling in nursing, working at Walter Reed Medical Center and practically running the place in her telling. A serious back injury forced her to leave nursing, which was heartbreaking for Pat but which she also put in perspective, describing how she understood that there were younger, more able-bodied people that would do a better job than she could. 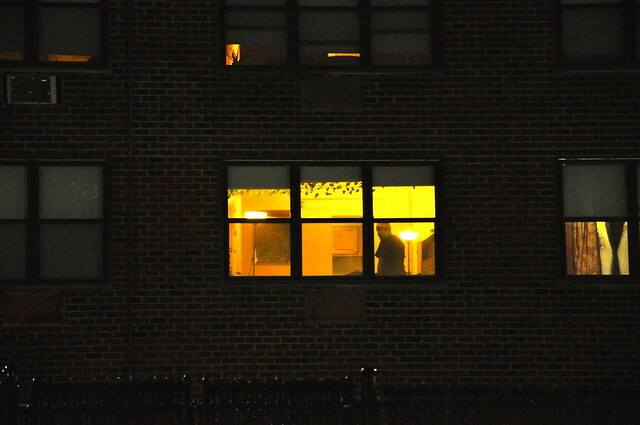 Around this time, she moved in to a project-based Section 8 subsidized apartment in Rindge Towers. Her passion could have been channeled elsewhere, but the residents of Rindge Towers are lucky she chose the path that she did. At the time she jumped into organizing tenants, she described a personal conflict around whether or not she wanted to channel this energy into protecting the environment and animals. 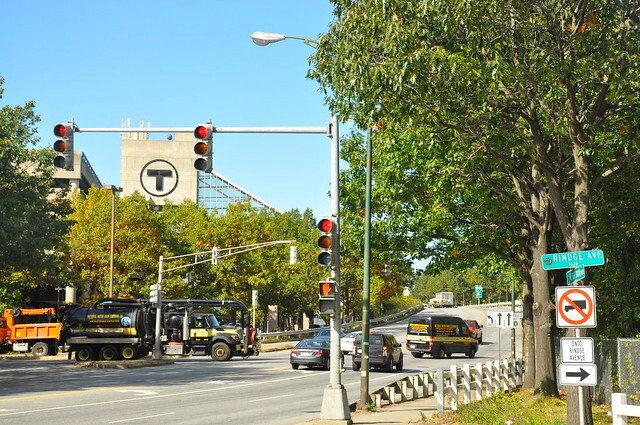 She described her concerns at the time about the lack of green space near Rindge Towers and the need to integrate “urban nature” into the Boston area. Her main concern now is with the future of tenant organizing at Rindge, and in the Boston area in general. She jokingly told us, “I used to be a young rabble rouser, now I’m an old rabble rouser,” but there was an edge to it. Now that she is primarily homebound, Pat can’t do as much rabble-rousing as she used to, and despite all her efforts, affordable housing at the Rindge Towers may be lost. The regulations that keep it affordable will expire in 2020, and as a one-woman organizing machine, Pat doesn’t have a successor lined up to take her place. 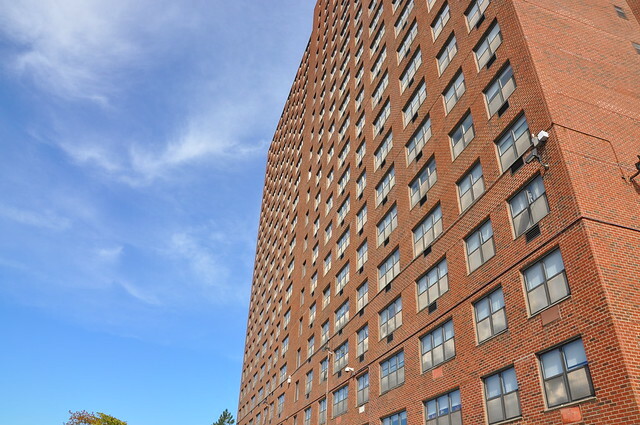 The story of Rindge Towers reflects the larger story of affordable housing in the Boston area. Organizations like the Mass Alliance of HUD Tenants, alongside people like Pat, have saved thousands of affordable apartments in the last few decades. 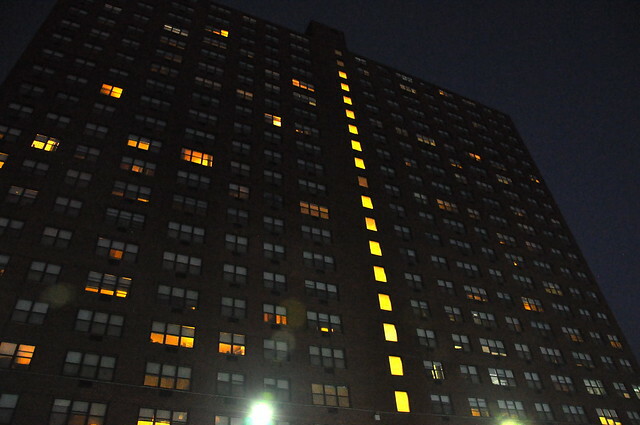 However, like Rindge Towers, the affordability of many thousands more is scheduled to expire. With what Pat describes as token gestures to eliminate the political base of tenant advocacy in places like Rindge – free summer barbecues and cheap renovations – a perfect storm is brewing for mass displacement of low-income families in Boston. We hope that sharing Pat’s story will ignite a fire in a new generation of tenant organizers. Though Pat is one-in-a-million, perhaps one or two will have her unique combination of drive, political acumen, and most importantly, love. As Pat put it, “my spirit is strong, but my body can’t keep up.” It will take a lot of effort to keep up with Pat, but her story shows that it is possible. Post by Rachel Finkelstein and Ashwin Balakrishnan. Photos by Ashwin Balakrishnan. • Rindge Towers is one of six buildings profiled by students in the fall 2013 MIT course, “In This Building.” See what it’s like to be at the other five buildings. 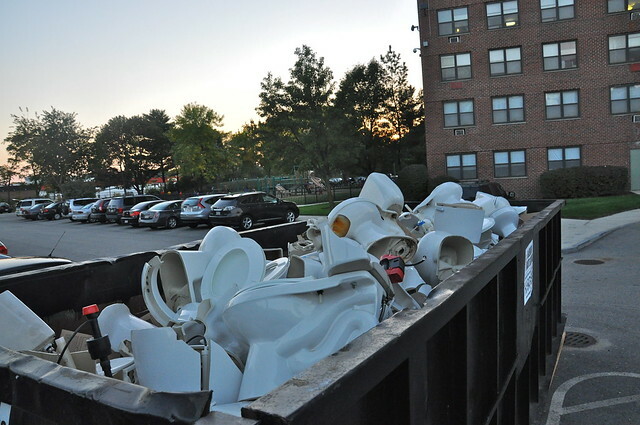 The picture of the toilets is very disturbing because I would think that they can recycle them. I know it doesn’t cost that much for a new one but we are heading in a more of a green time of life. What are your thoughts?